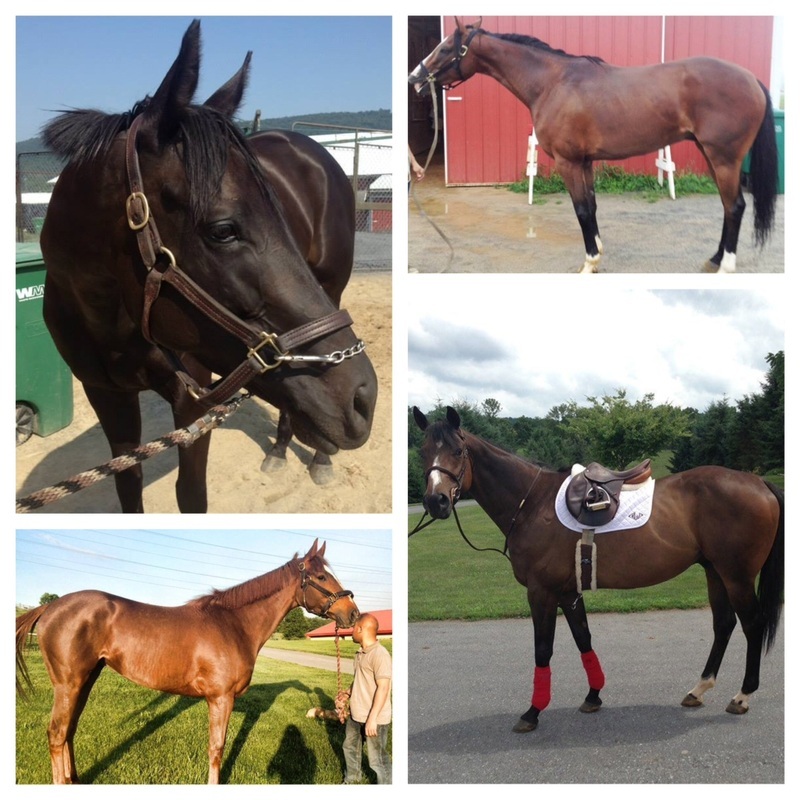 visit our facebook page to see hundreds of pics & alumni updates/pics!! 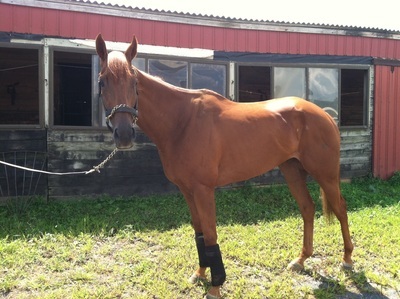 He now lives in North Carolina! 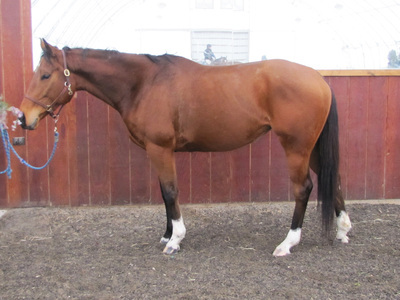 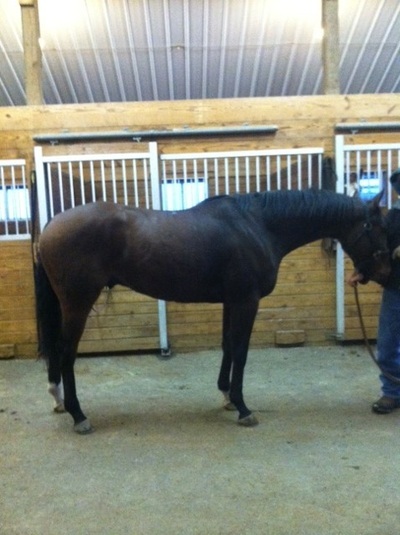 4 yo Dark Bay Gelding. 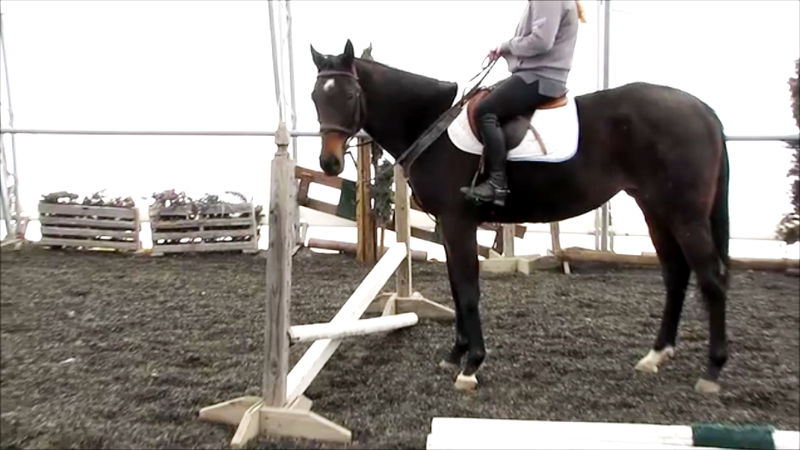 15.3 3/4 HH+ Retiring sound. No vices. Check out a video of his FULL SISTER!!! 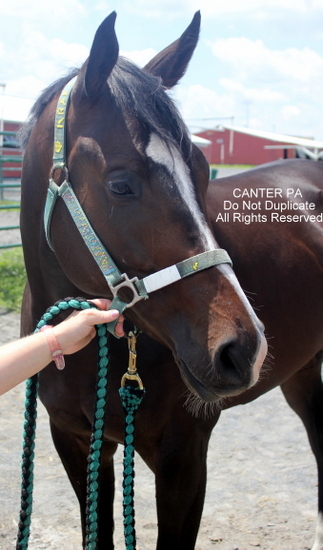 Her owner contacted us so we could share the video of his full older sibling as reference. 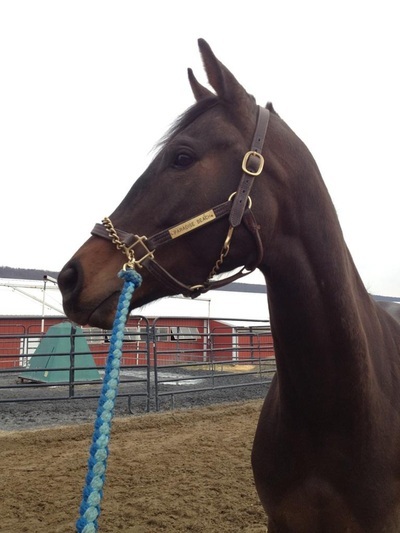 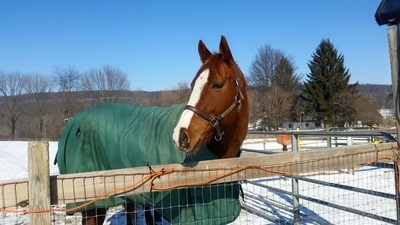 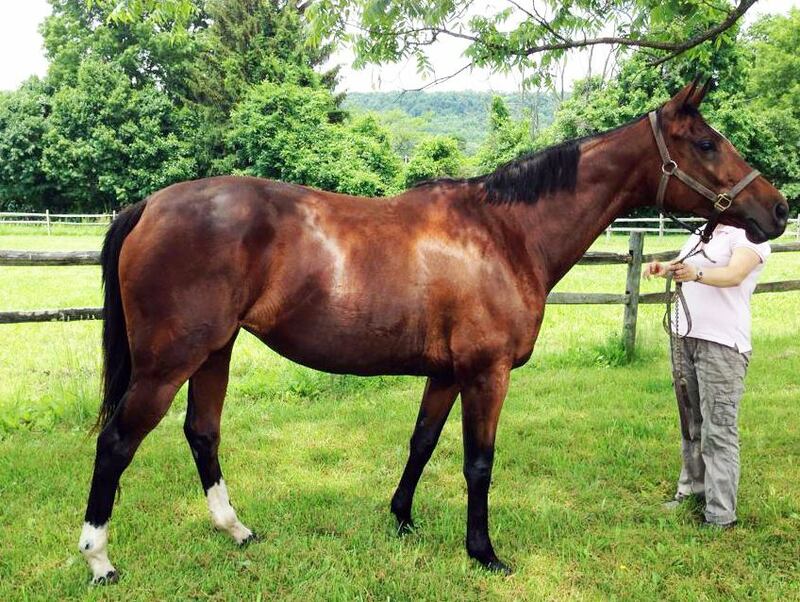 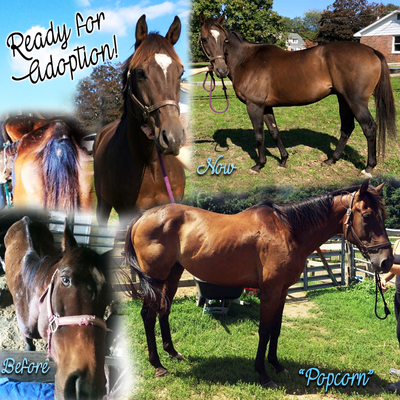 "POPCORN" (our Kill-Pen Rescue) Living in Harrisburg, PA with his new mom! 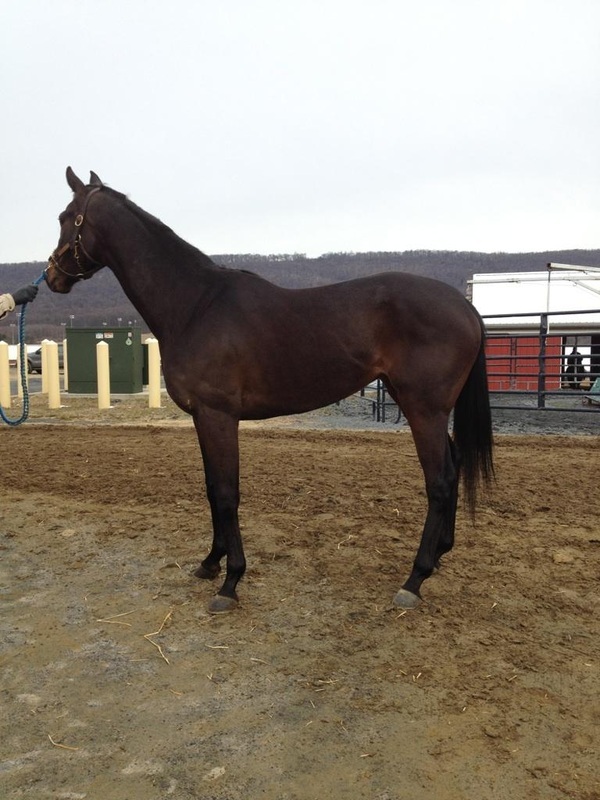 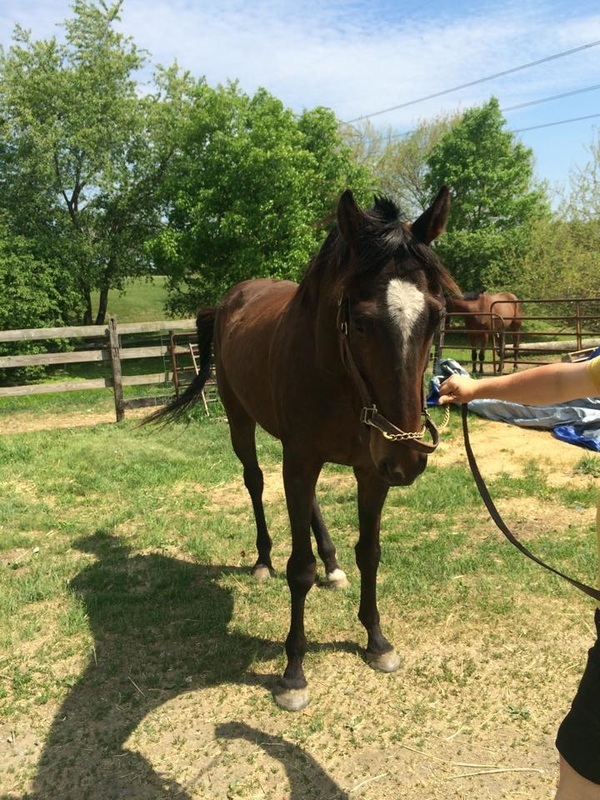 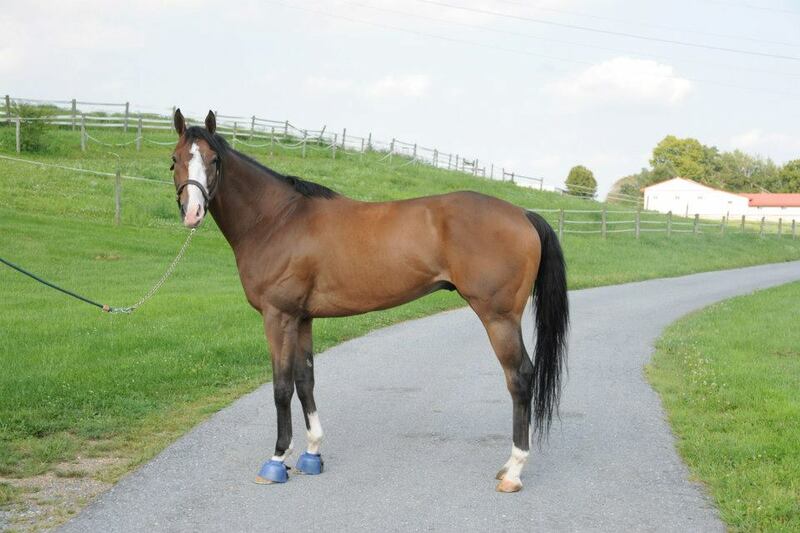 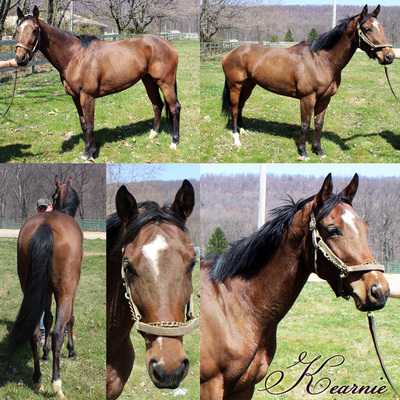 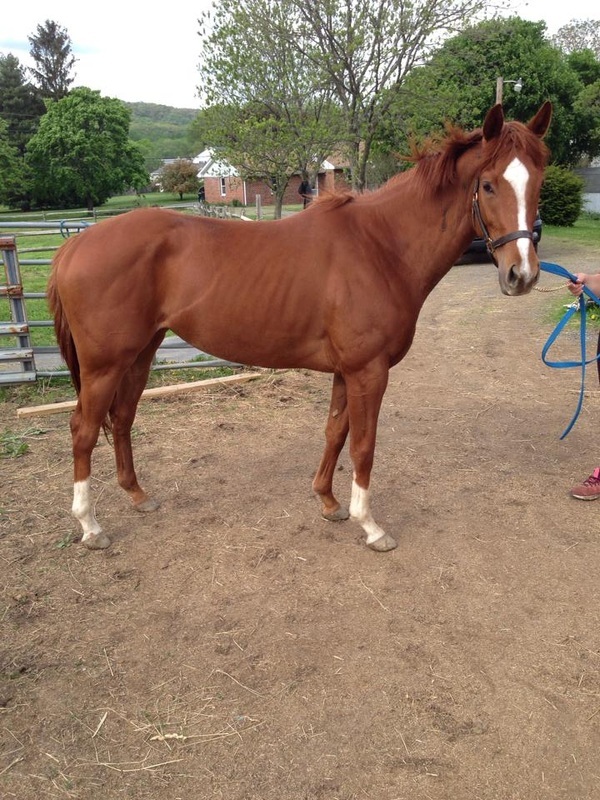 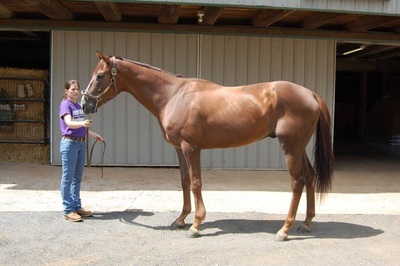 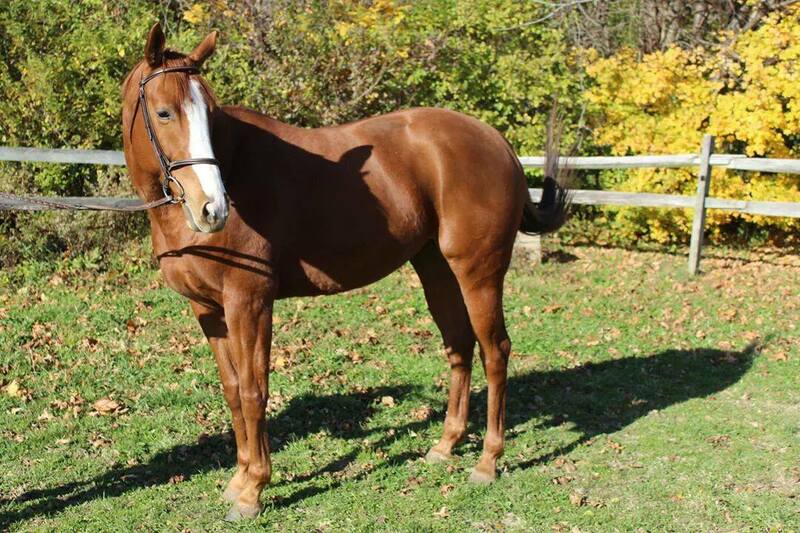 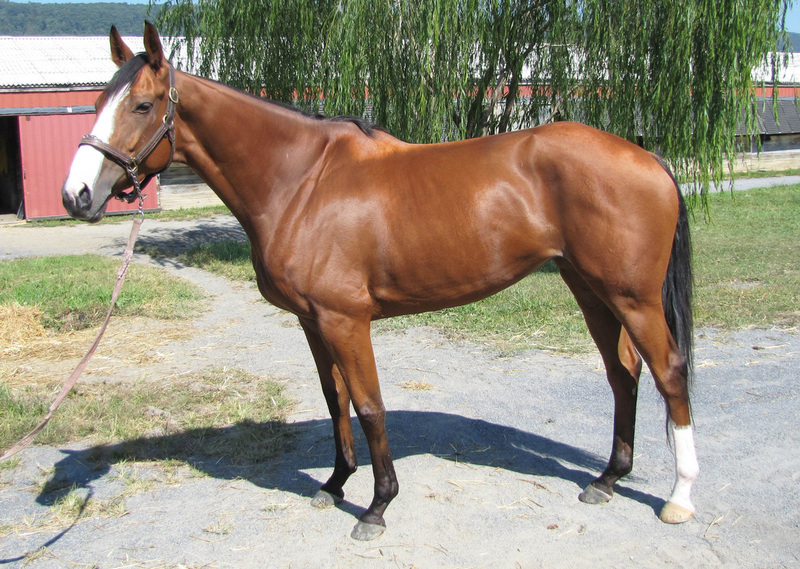 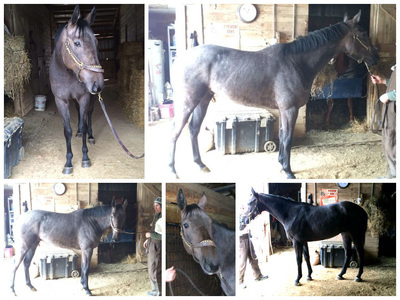 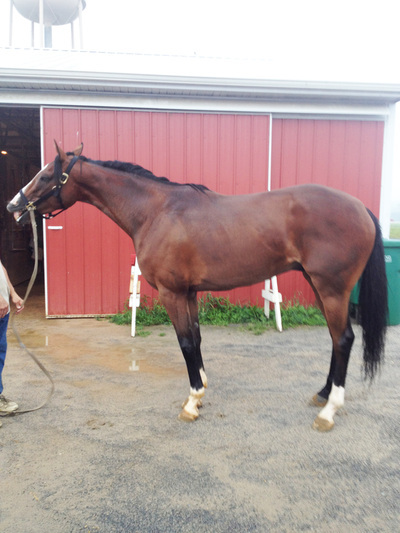 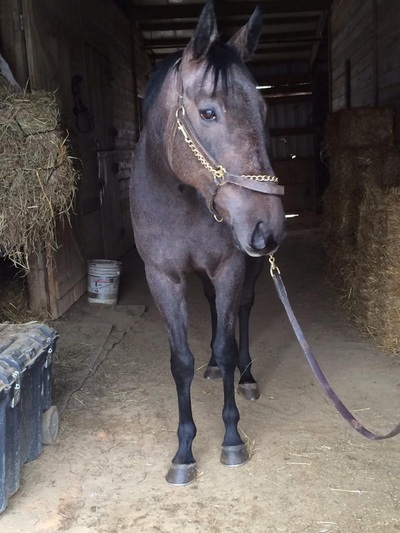 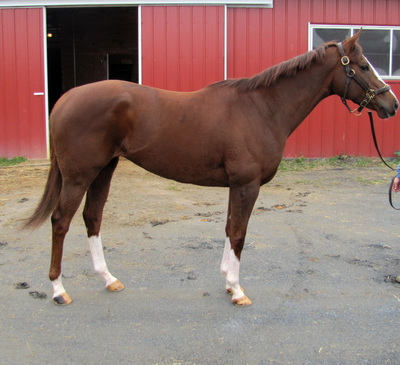 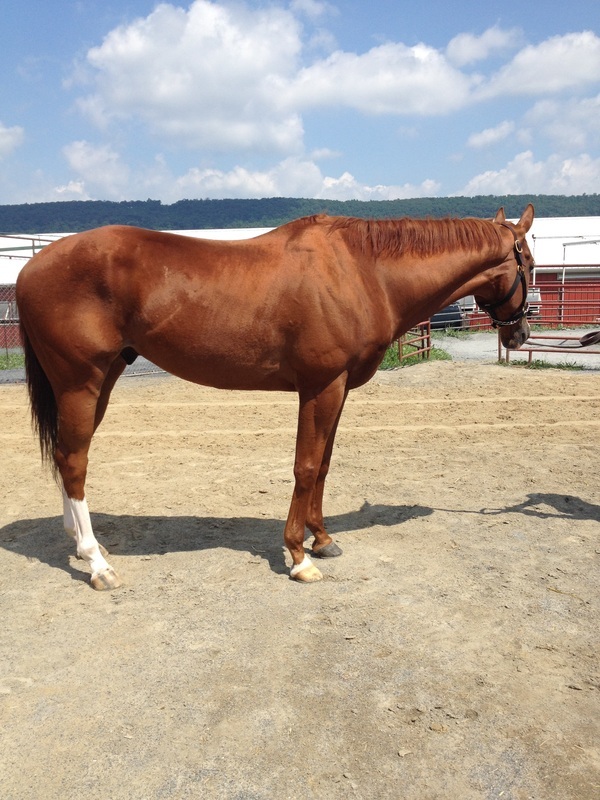 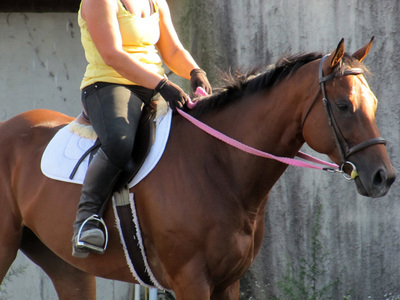 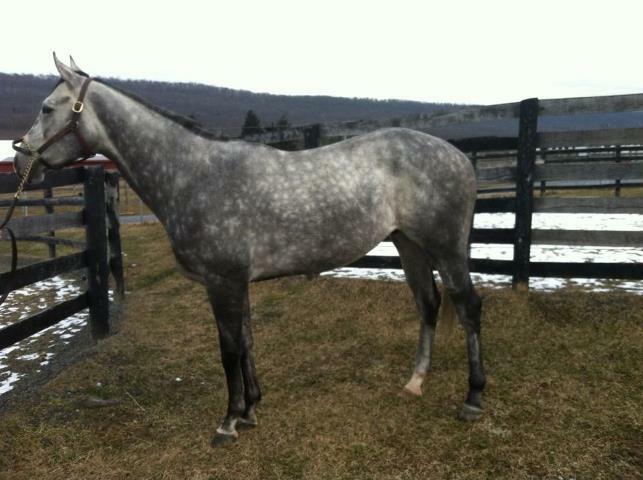 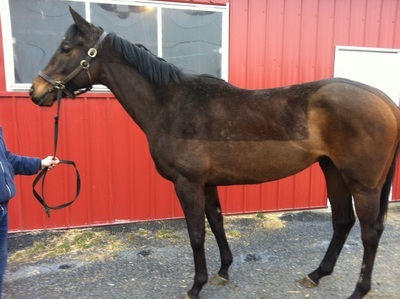 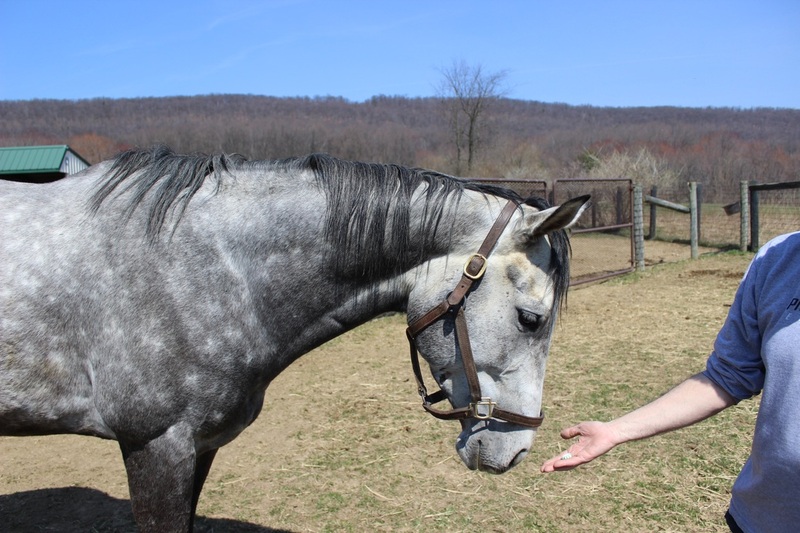 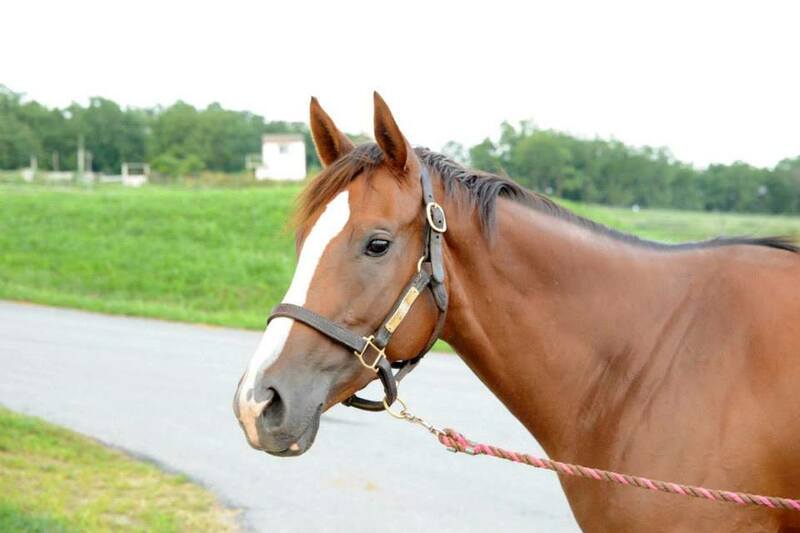 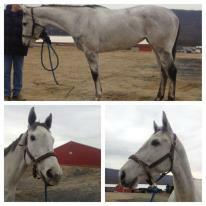 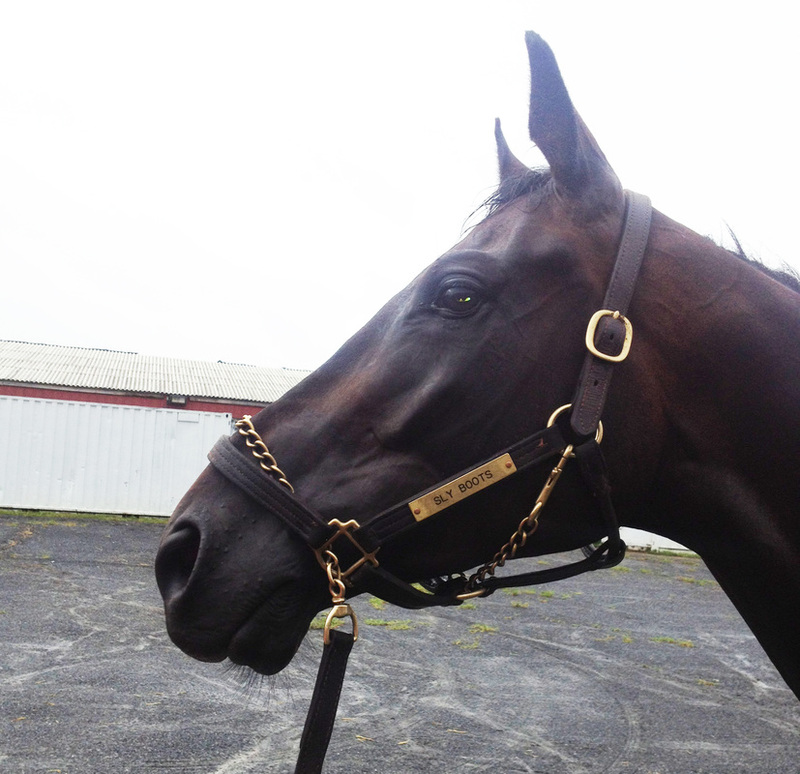 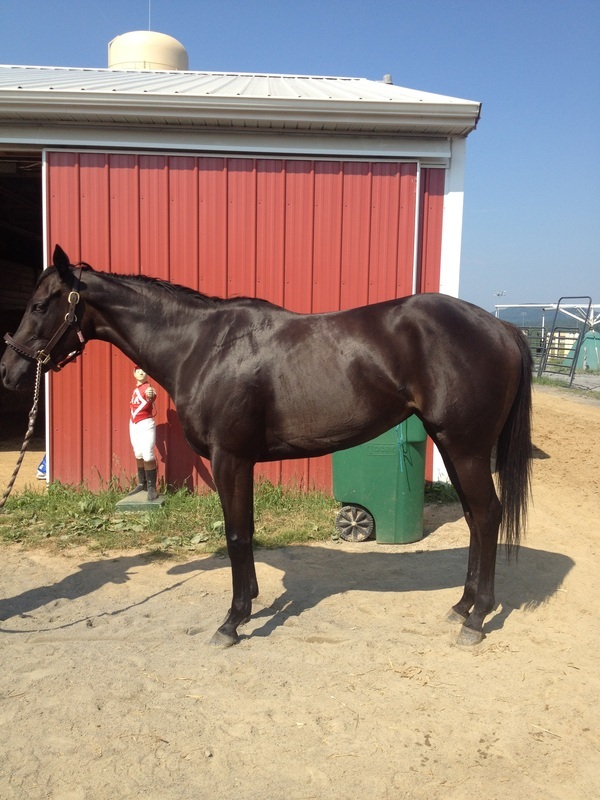 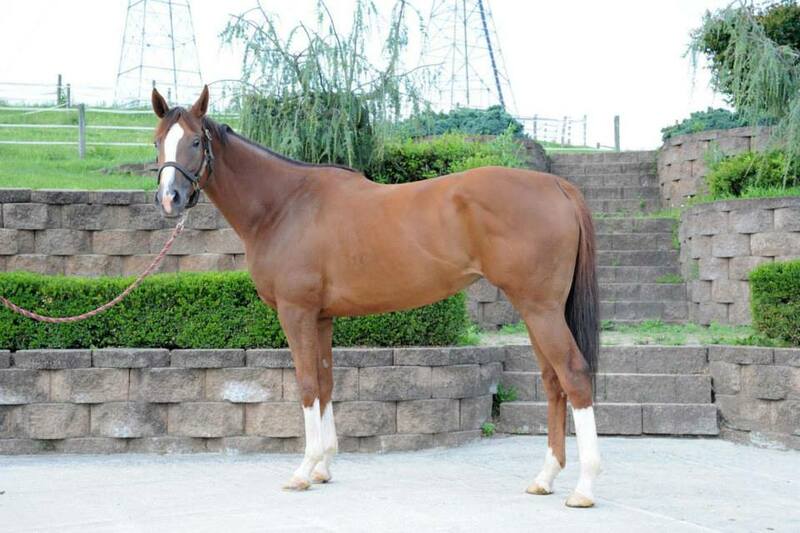 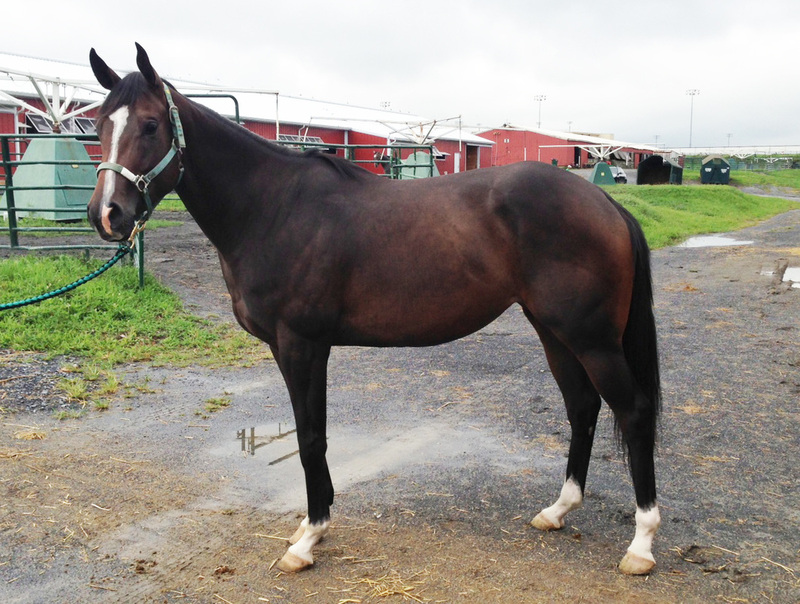 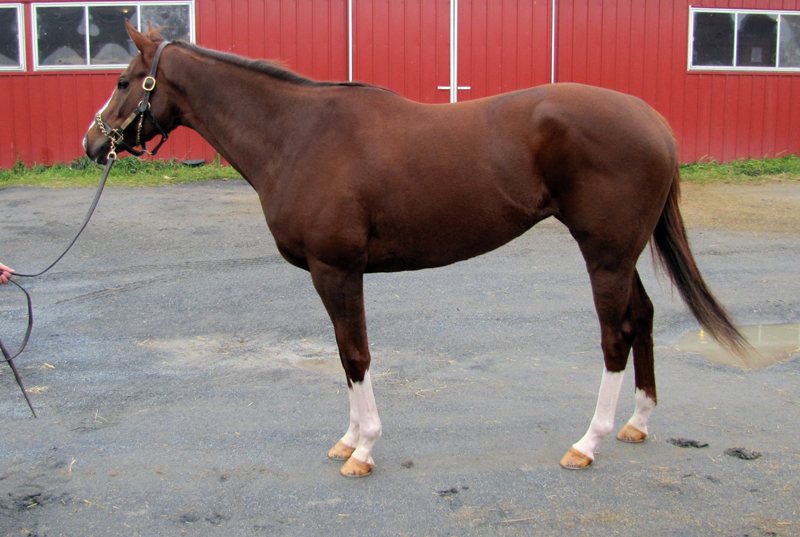 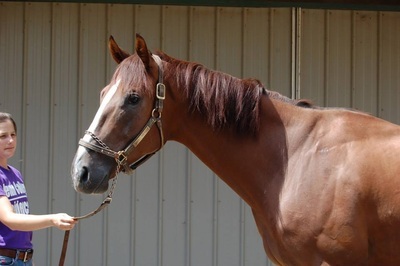 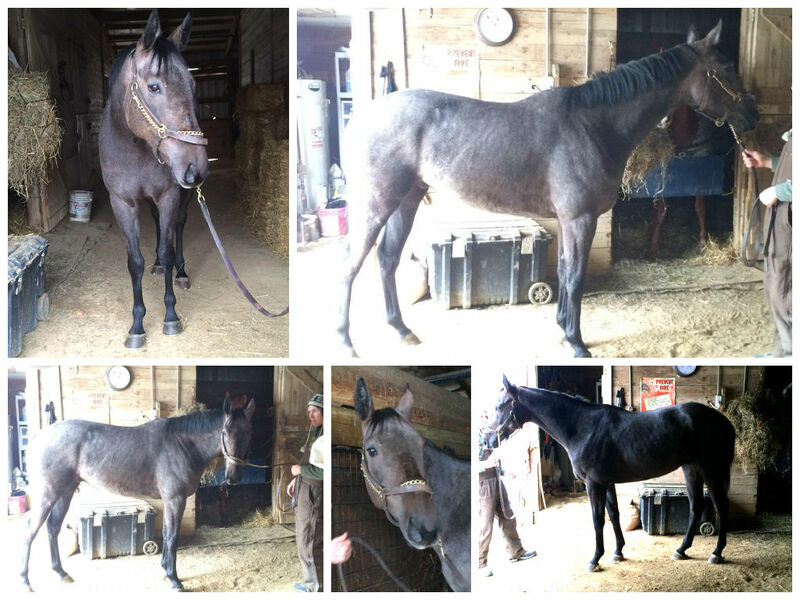 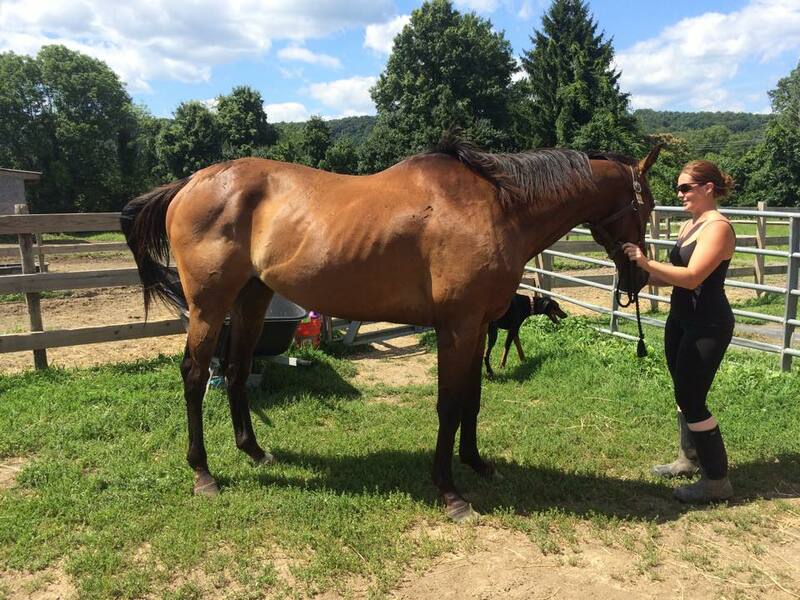 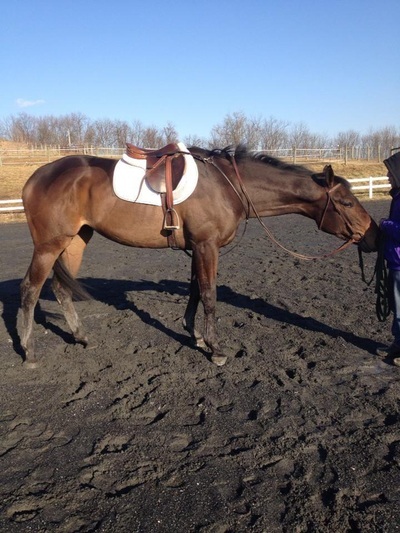 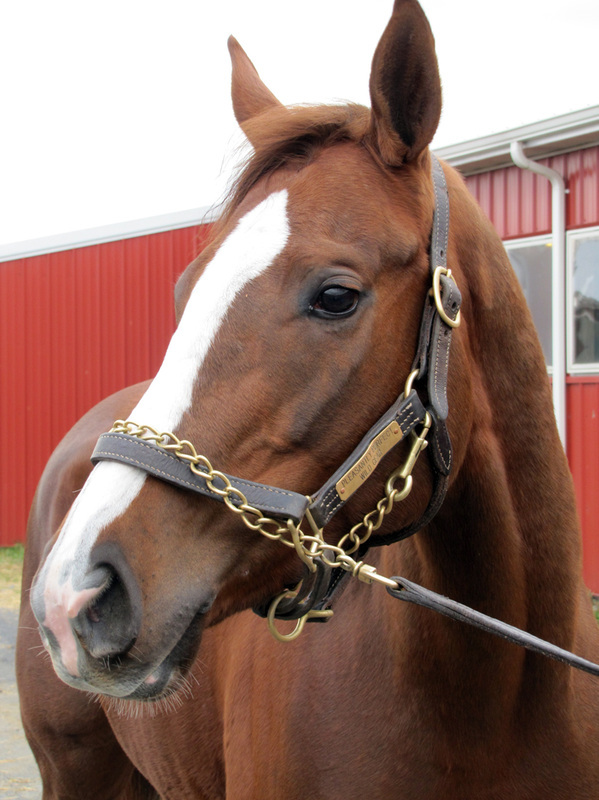 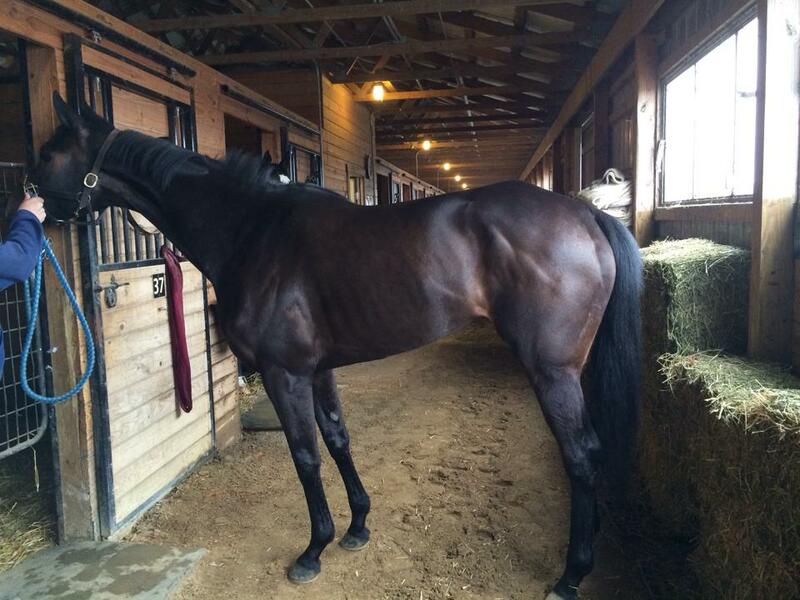 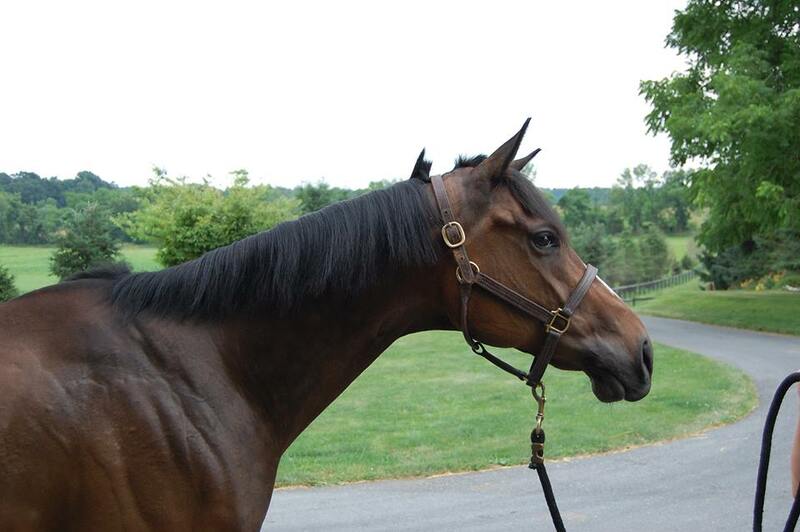 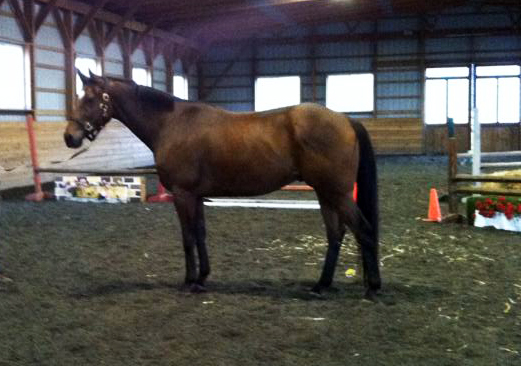 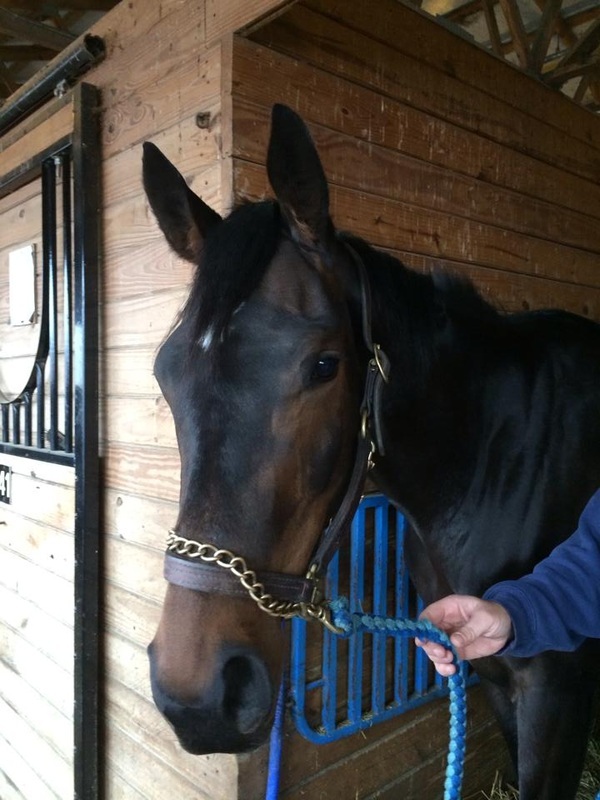 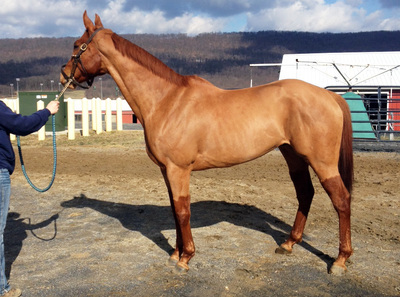 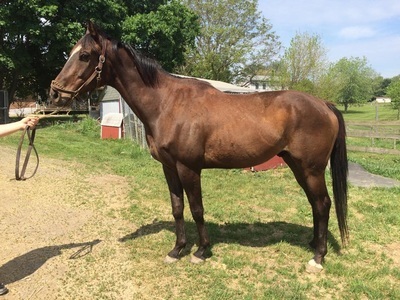 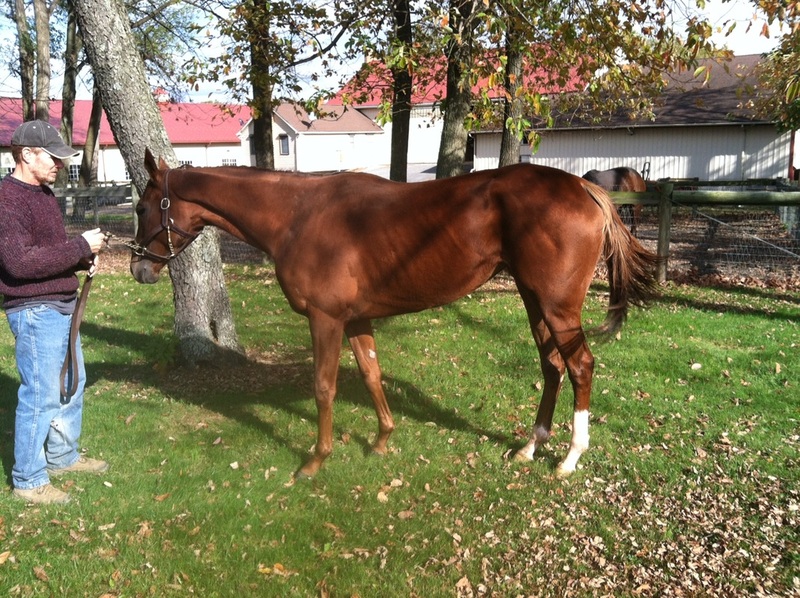 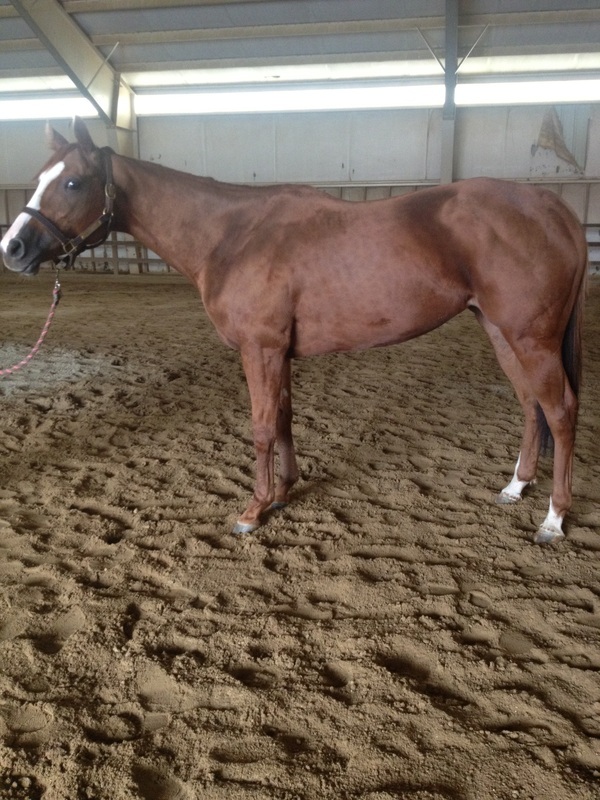 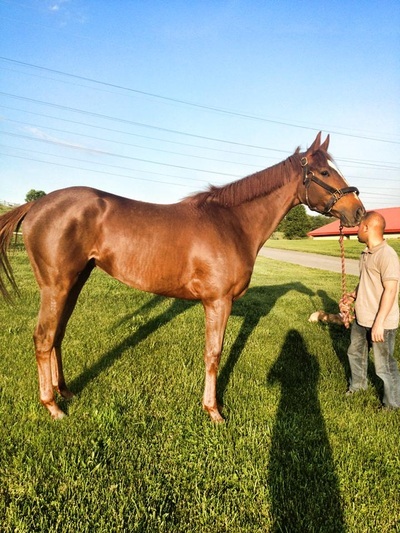 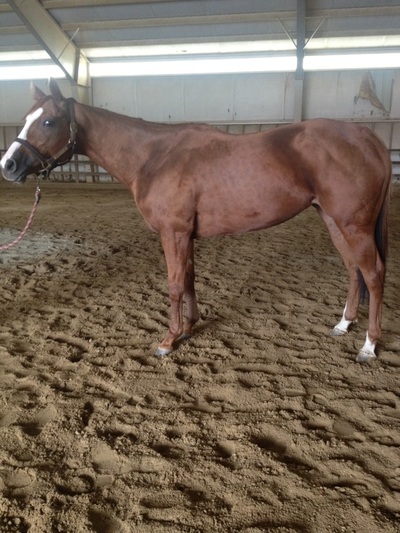 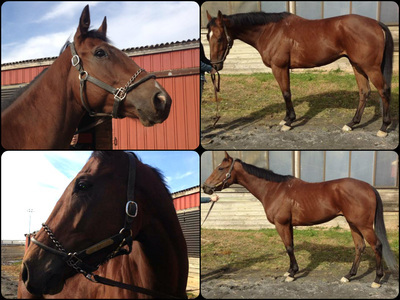 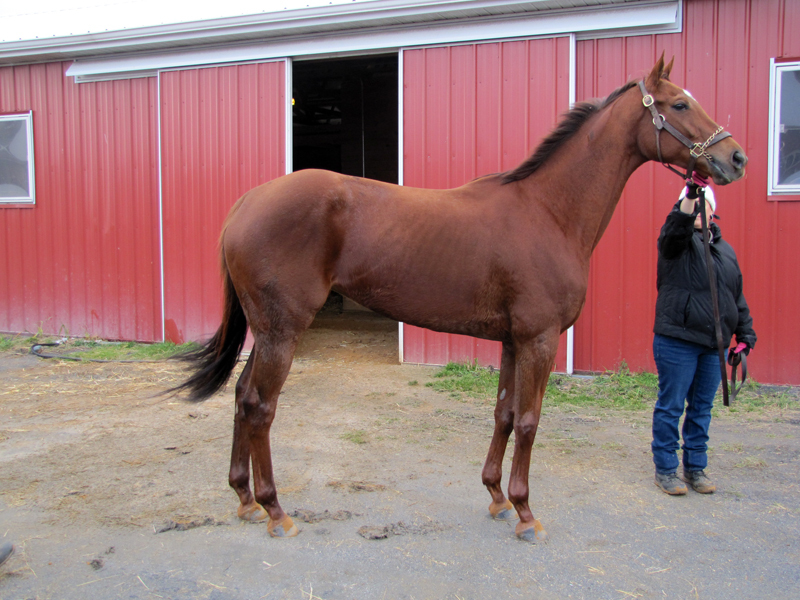 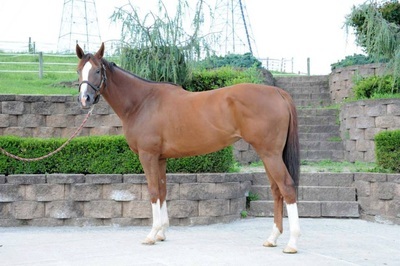 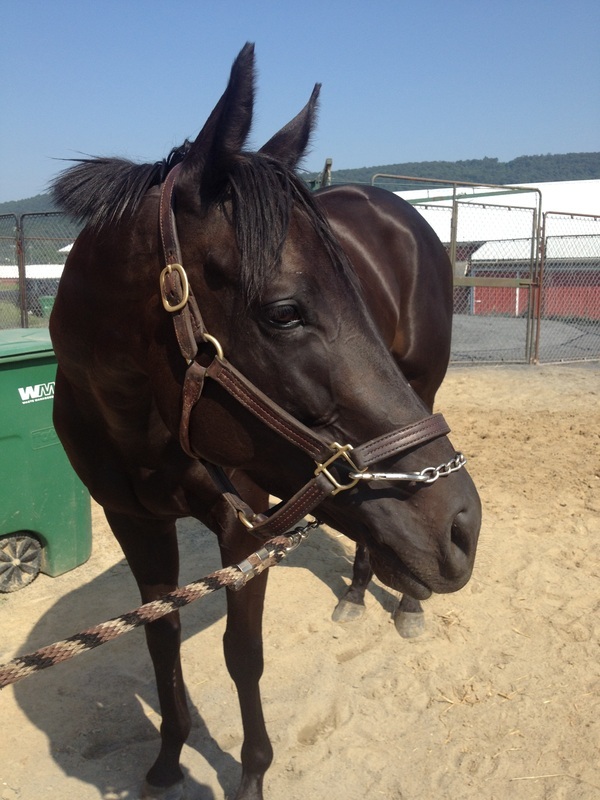 16.3 1/2HH estimated 5 1/2 yo TB Gelding $500 Adoption Fee. 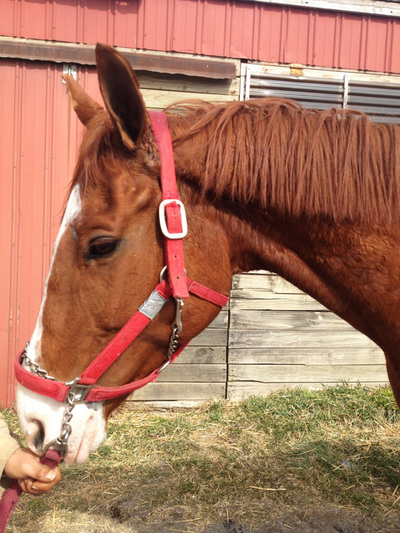 VIDEO from 10/31, his first real ride since being rescued! 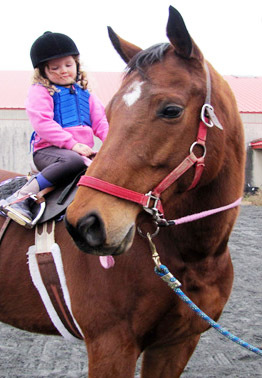 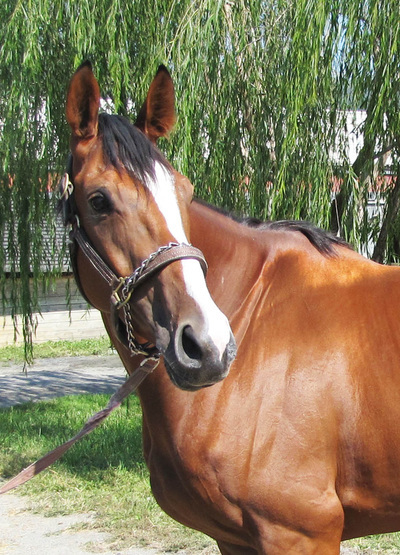 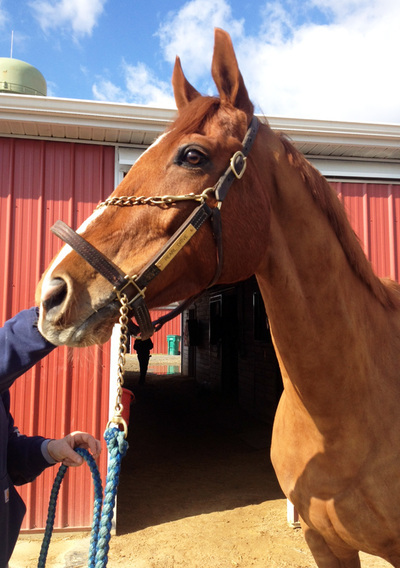 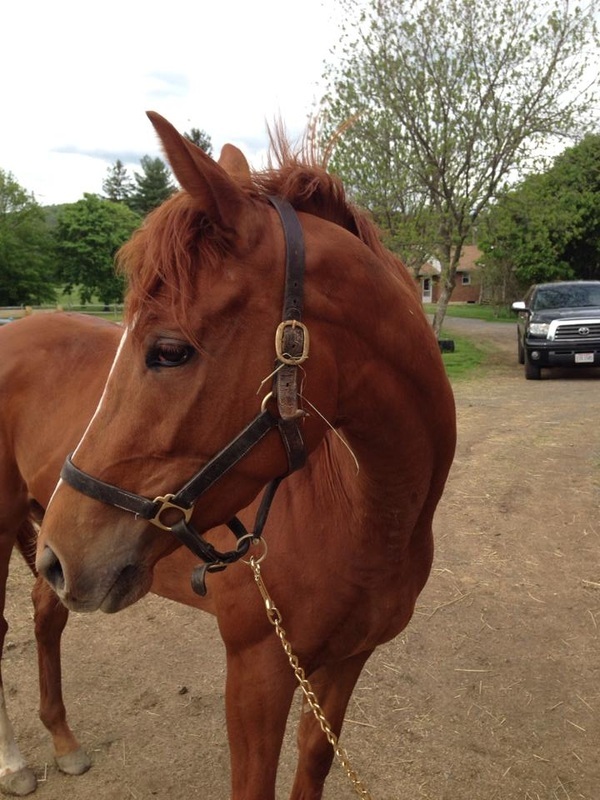 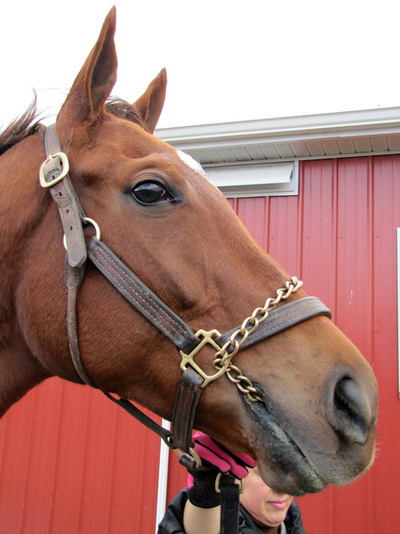 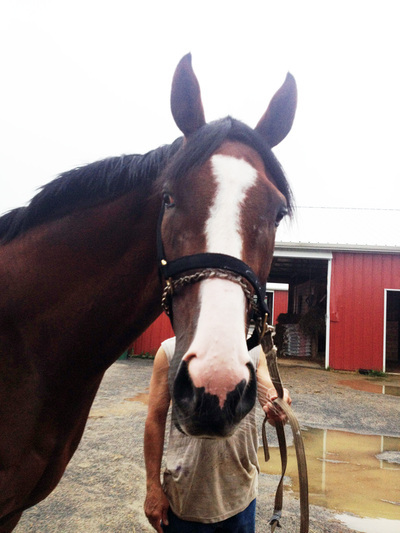 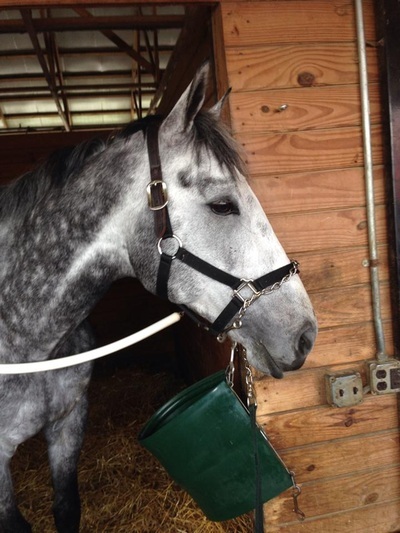 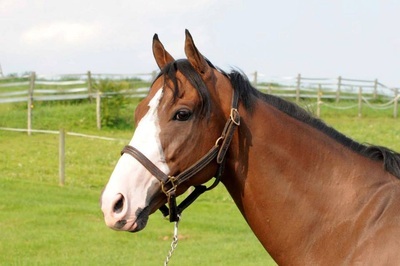 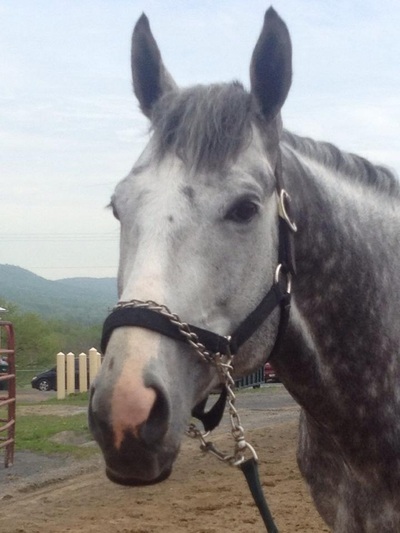 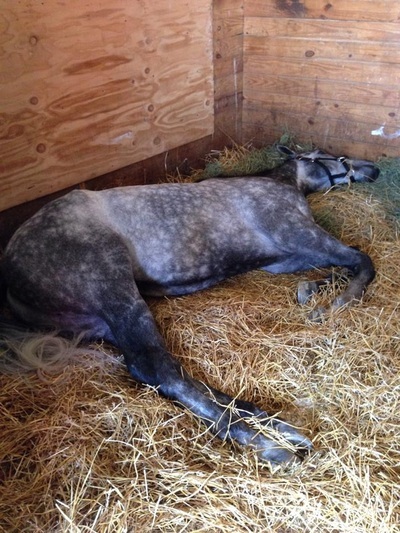 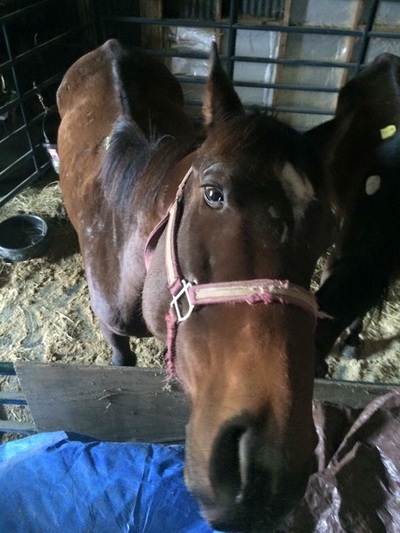 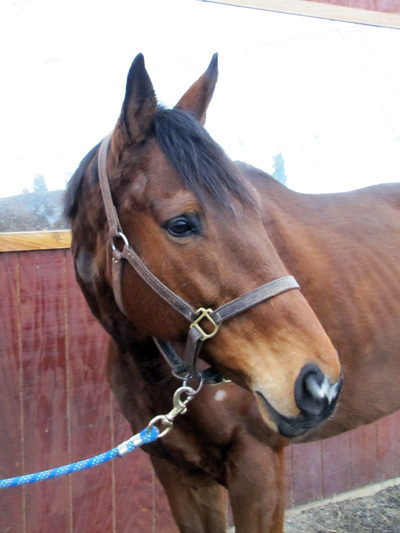 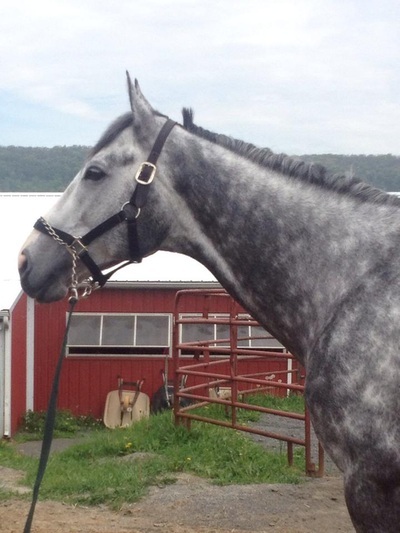 "Popcorn" was owned by the kill-buyer at an auction in February. 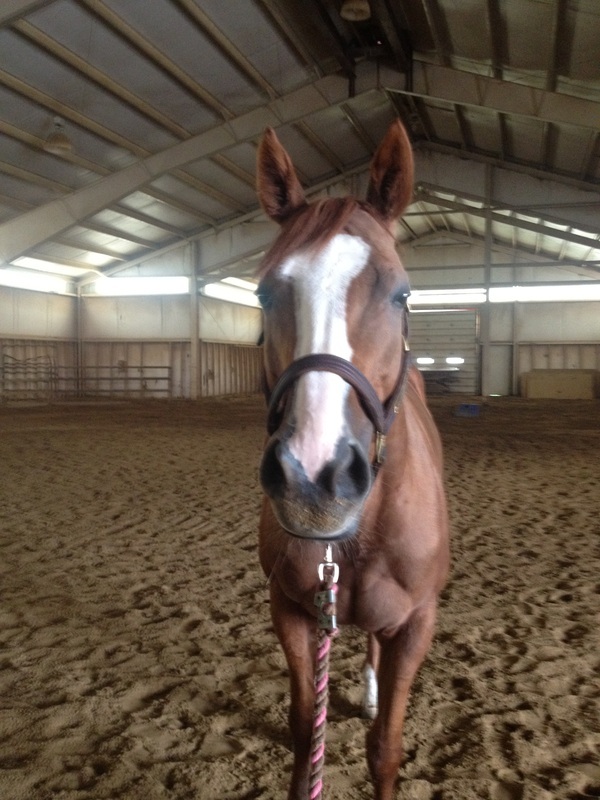 Who remembers "Popcorn"? He was the BIG guy we saved from slaughter in February. 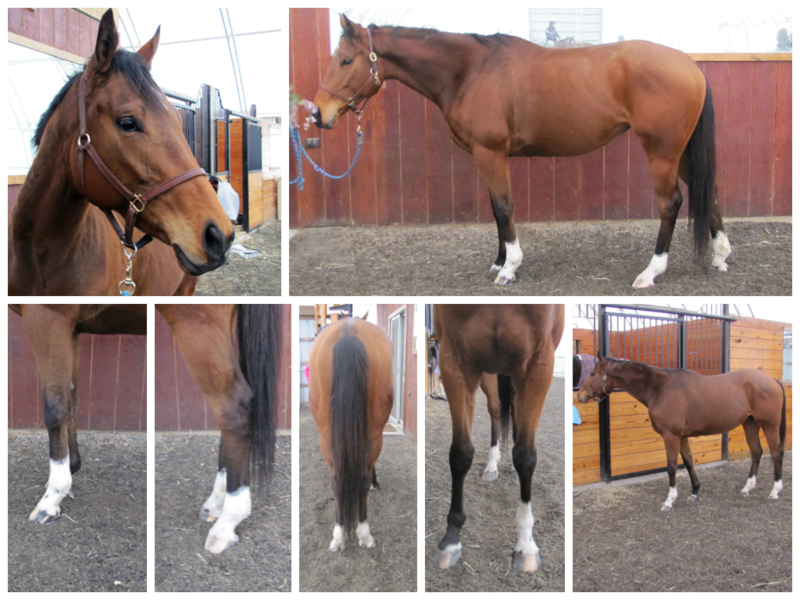 He has had a long road, fighting off a nasty respiratory infection with lime green snot, rain rot, and being skinnier than any horse his size should have ever been. 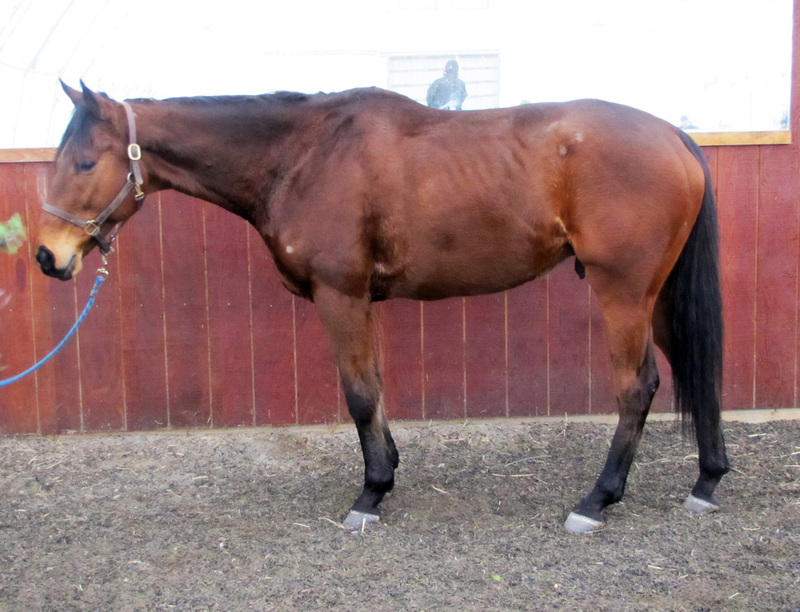 He was always sound from day one, only having an issue with some pesky hoof abscesses. 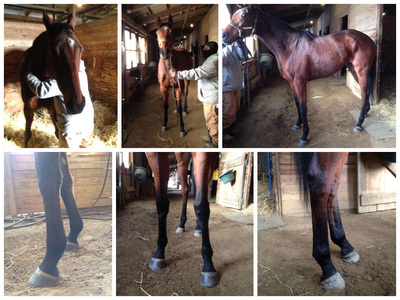 He does require front shoes as he gets a little tender footed if barefoot. 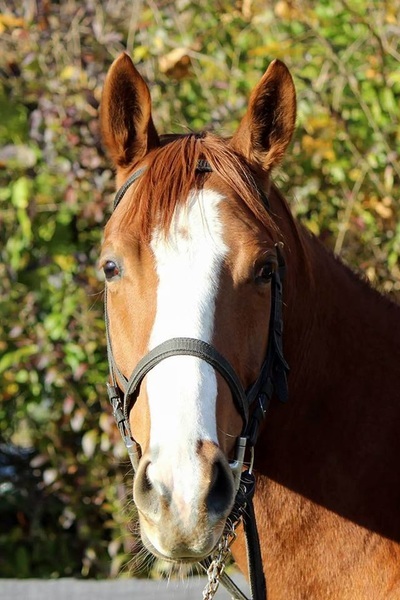 He loves people, loves attention, wants to always be in your pocket and see what you're doing. This horse will make you laugh every minute of every day! 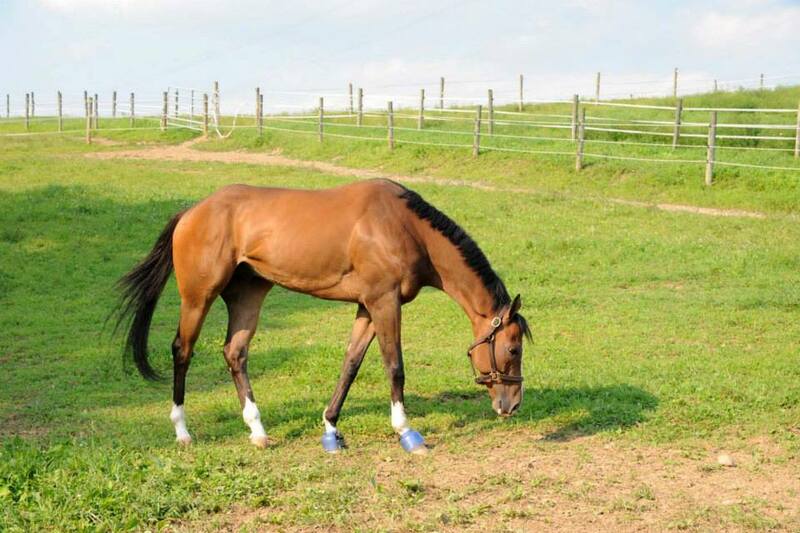 He gets along well with other horses and enjoys to eat. 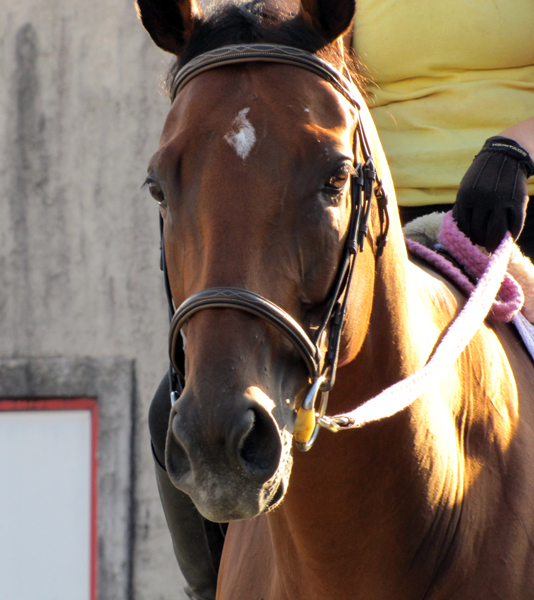 No vices. No issues. UTD on shots and was fully treated for his yucky respiratory infection / snotty nose back in February. 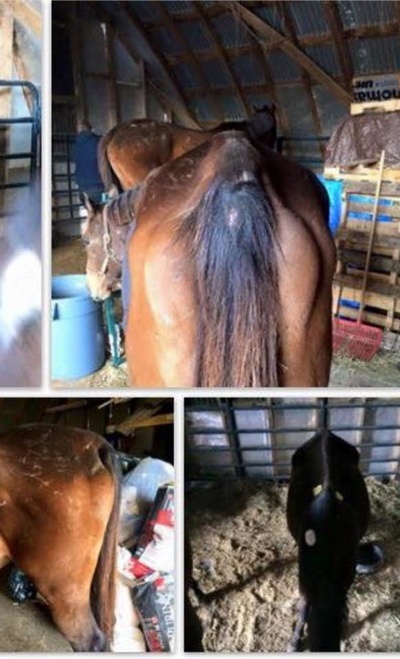 He does not have a tattoo and didn't come with papers so his history is unknown. 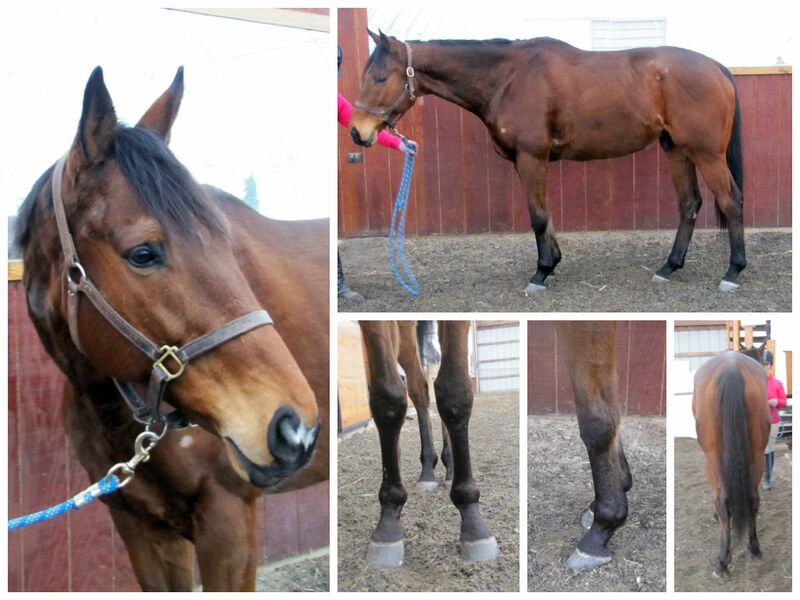 He has clean legs and has been in the care of a veterinarian (she has been fostering him since day one). 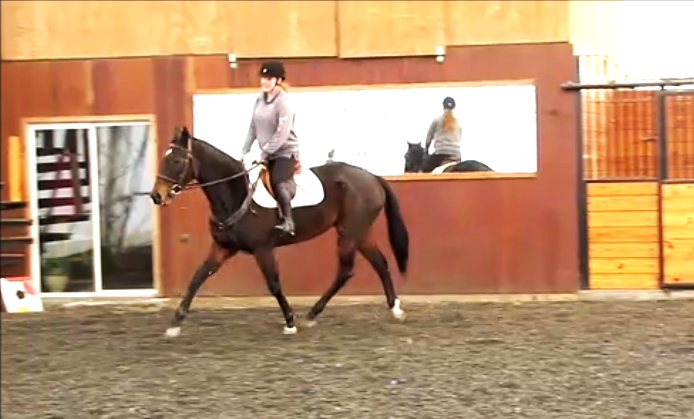 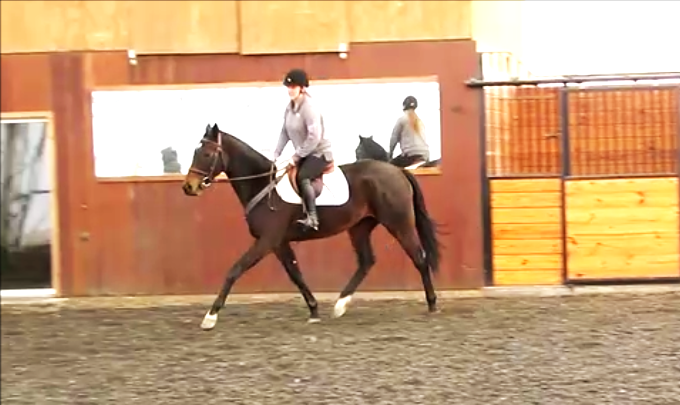 He is actually quite a pretty mover so dressage or even hunters could be in his future. 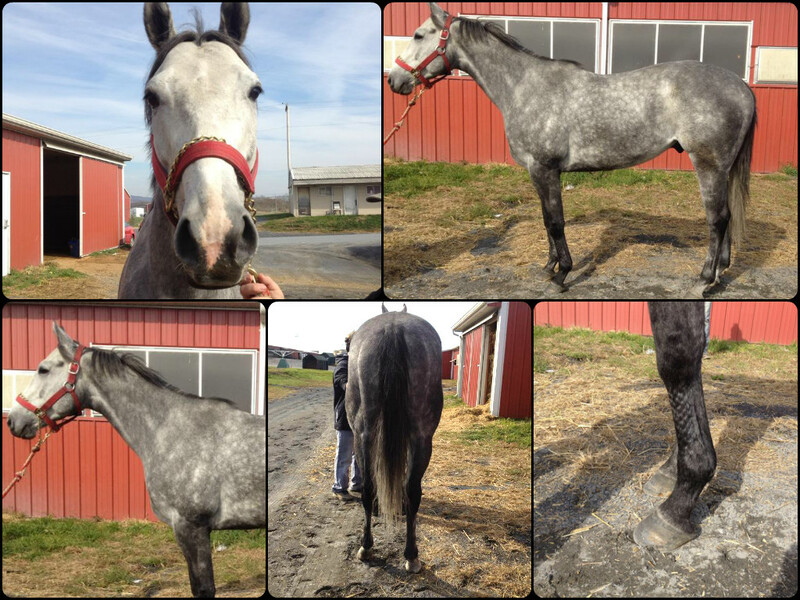 **Photos in comments from day we saved him until recent to show progression. 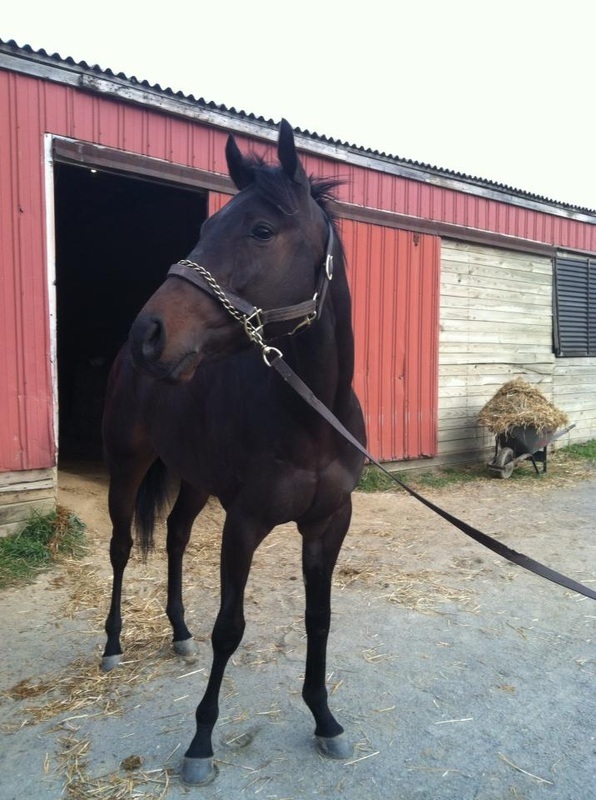 Appealing Lucy aka Lucy - Now living in SC!